Ribbon-cutting rehearsal. Photo © by Judy Wells. The good news about Disneyworld's New Fantasyland: it's flat. 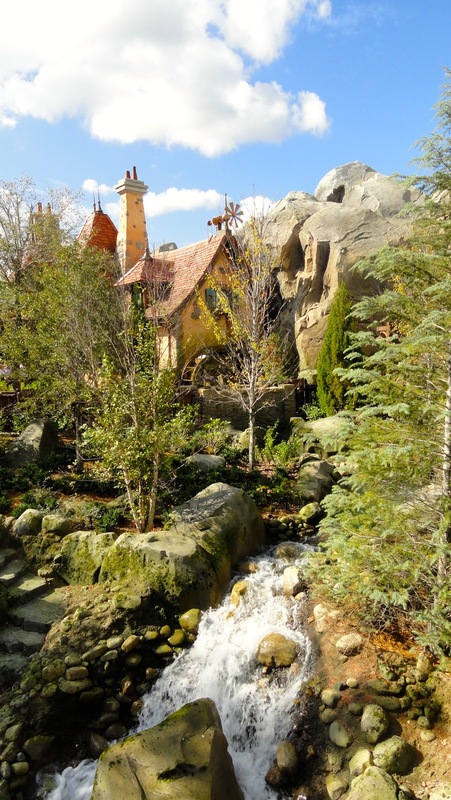 The bad news about Disneyworld's New Fantasyland: you will walk and stand a lot. To be fair, most of the walking will be done getting to and from parking lots. The New Fantasyland is nicely compact. 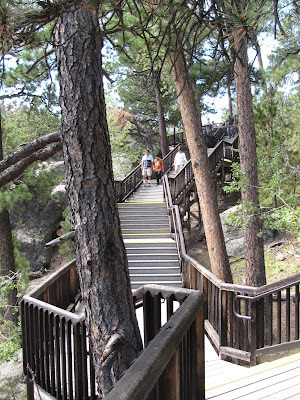 Tip: There are a few stairs but in every case there are ramps as well although that adds to the walking. New Fantasyland is divided into three areas, Beauty and the Beast, Under the Sea - Journey of the Little Mermaid and Storybook Circus. Maurice's Cottage. Photo © by Judy Wells. Beauty and the Beast is the most impressive section, containing the Beast's Castle with its Be Our Guest Restaurant, Maurice and Belle's Cottage, Belle's Village, Gaston's Tavern, Bonjour! Village Gifts and the Enchanted Forrest. Lumiere and Belle. Photo © by Judy Wells. The "attraction" here is Enchanted Tales with Belle in Maurice's Cottage. Visitors assemble into groups of about 25 to be welcomed and to enter through the enchanted mirror into a dressing room where Madame Wardrobe (voiced with gusto by the wonderful Jo Anne Worley) provides the props for the characters - selected from the crowd - in Belle's tale of meeting the Beast. 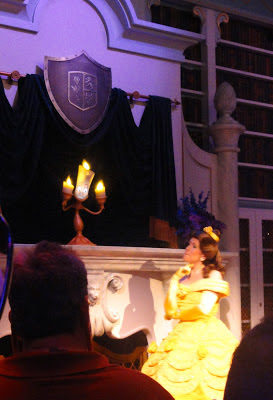 Next it's off to the library where, aided by the volunteer cast, Lumiere and Belle tell her story. It's a fun bit, thanks to the audience participation. Tip: You'll stand during the assembling and introduction to the enchanted mirror then sit on benches for the casting and storytelling. If accompanied by children, try to get a seat in the front where you and they have a better chance of being volunteered. Volunteers get a kiss from Belle and a book mark. Detail of a "beast" in Beast's Castle. Photo © by Judy Wells. Even if you don't plan to eat there, go through the gates and across the stone bridge to see the inside of the Beast's Castle. Carefully plotted and executed details begin with the Armor Hallway, where the six suits of armor whisper occasionally. The ballroom is is grand, the Rose Gallery is pretty and the forbidden West Wing is dramatic with its ripped portrait and belled-jar covered rose. Altogether impressive. Entrance to Under the Sea. Photo © by Judy Wells. Under the Sea - Journey of the Little Mermaid, situated just below the approach to the Beast's Castle, is one of the cleverest of Disney's new creations. You wind through a coral-banked walkway into a sea cave with its wrecked galleon and pirate treasure. Myriad details, including a tribute to the first under the sea ride, the Nautilus of 20,000 Leagues Under the Sea, lessen the wait so pay attention. Finally you reach a moving line of clam shells which take you through a dark ride that retells Ariel's story. Delightful from start to finish. 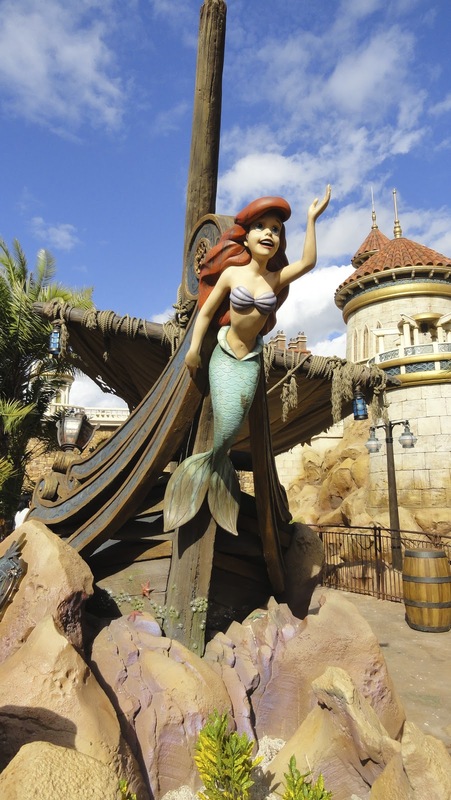 You can meet Ariel herself in Ariel's Grotto. The clam shells don't stop so you'll need to move. Photo © by Judy Wells. Tip: The only problem here is getting into those moving clam shells but staff is there to help. Continue walking away from the castle and you'll be in Storybook Circus which recreates in great detail the heyday of the big tops. Now there are two Dumbo rides. Photo © by Judy Wells. Flying with Dumbo, always a popular if too short ride, has doubled its capacity. 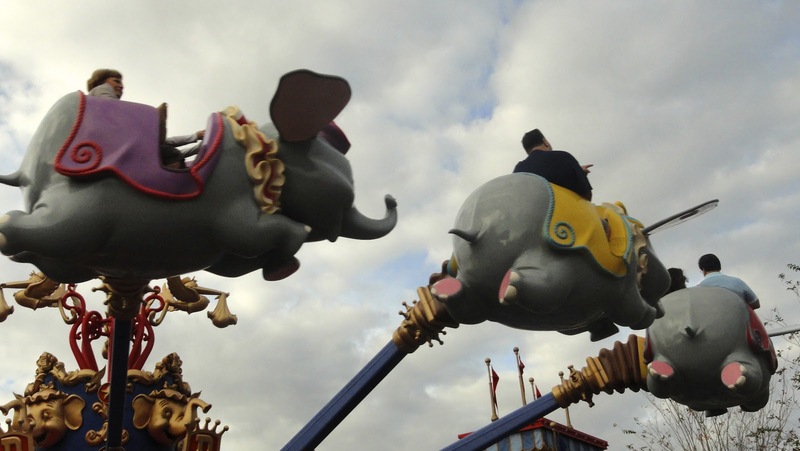 Now you can choose between a Dumbo flying clockwise or one going counterclockwise. Best of all, there's no waiting in the usual sense. Get a pager upon entering then play in the circus area until it buzzes for your ride time. Clever, those Imagineers. Here comes the coaster. Photo © by Judy Wells. The Barnstormer, a relatively gentle coaster, is now the Great Goofini and Disney characters are met at Pete's Silly sideshow. Get sprayed by an elephant. Photo © by Judy Wells. Centering the circus is Casey Jr. Splash 'N' Soak Station where cartoonish elephants spew water from their trunks which the kids will love, especially in summer. Ride the train, save steps. Photo © by Judy Wells. 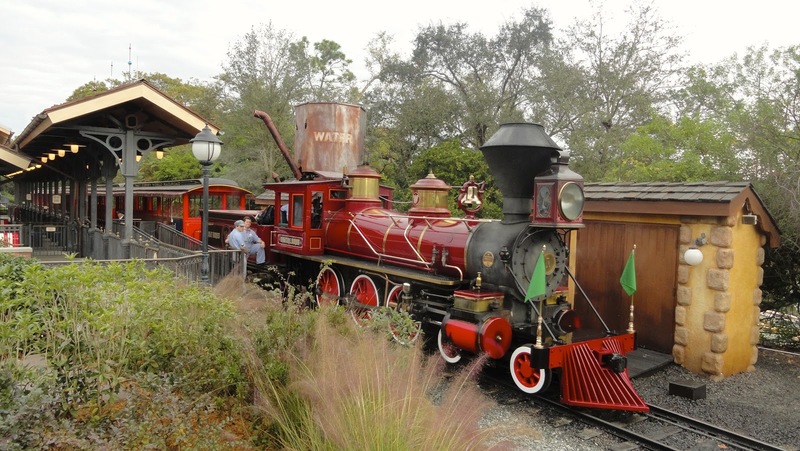 Tip: Cut out a lot of steps by catching a nostalgic train at the Fantasyland Train Station here to head to another part of the park. Beast's Ballroom. Photo © by Judy Wells. 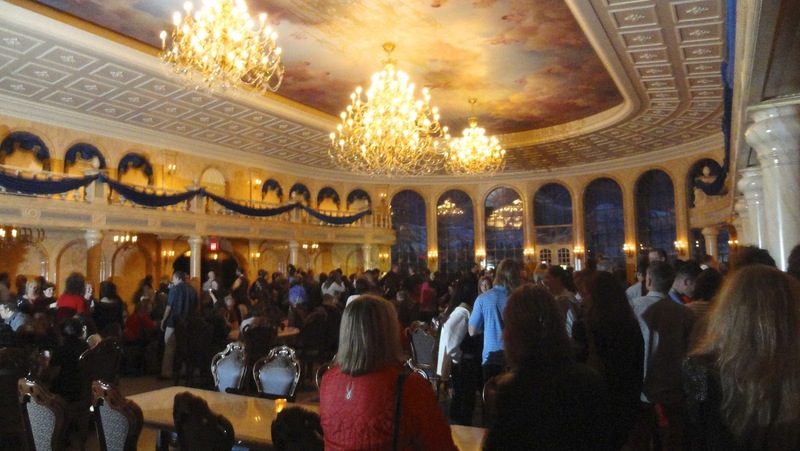 By day, Be Our Guest Restaurant inside the Beast's Castle is a rather elegant, French-themed version of Disney's standard quick order and eat stops. 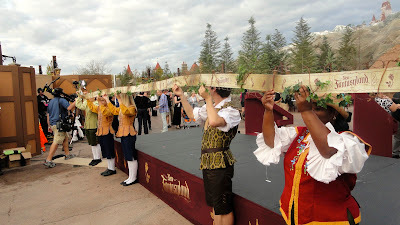 By night, however, it becomes a finer dining establishment with table service and, a first for this Fantasyland, wine and beer to accompany the French-inspired cuisine. Gaston's for pork shanks and LeFou's brew. Photo © by Judy Wells. 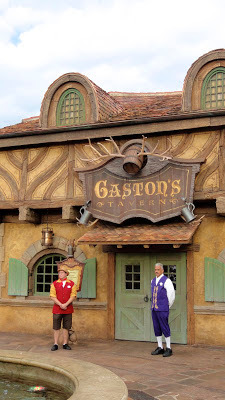 Gaston's Tavern, the village version of an order and eat, is a bit disappointing. The huge cinnamon rolls are popular but the enormous pork shanks are rather off-putting. That and a few snack choices are it other than the "signature" drink (shades of butterbeer), LeFou's Brew, $9.99. Actually, the drink's not bad, but a brew and a pork shank as lunch fare may soon have dietitians signing petitions of disapproval. Coming next... Photo © by Judy Wells. Still to come between now and the end of 2015, Princess Fairytale Hall and The Seven Dwarf's Mine Train. Mount Rushmore.© by Judy Wells. 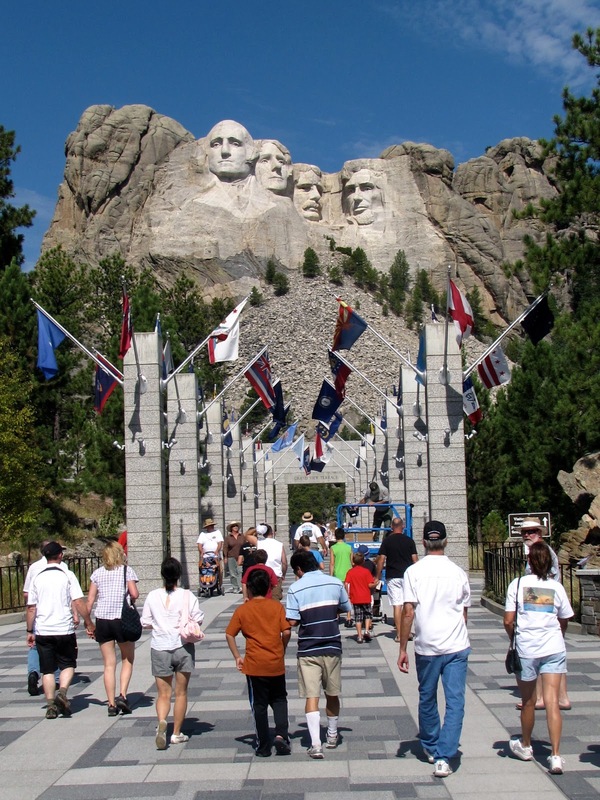 People from all over the world visit South Dakota to see Mount Rushmore and Crazy Horse, monumental carvings honoring men who were important to our nation's residents. Chief Crazy Horse Memorial. © by Judy Wells. Both are carved or being carved into mountains which often makes access difficult. Not in this case though. En route to Mount Rushmore via Iron Mountain Highway. © Photo by Judy Wells. Tip: There are more direct routes but I highly recommend approaching Mount Rushmore via the 14-mile-long Iron Mountain Highway. The scenery is spectacular, especially that first glimpse of Rushmore when the light gray spot on the mountain becomes the distinctive faces of Presidents Washington, Jefferson, Theodore Roosevelt and Lincoln - just like in all the photographs you've ever seen. The road isn't for the faint of heart, as it and even bridges coil steeply around - pig tail curves they call them - with one-lane-wide tunnels cut through the rock. An unforgettable experience. 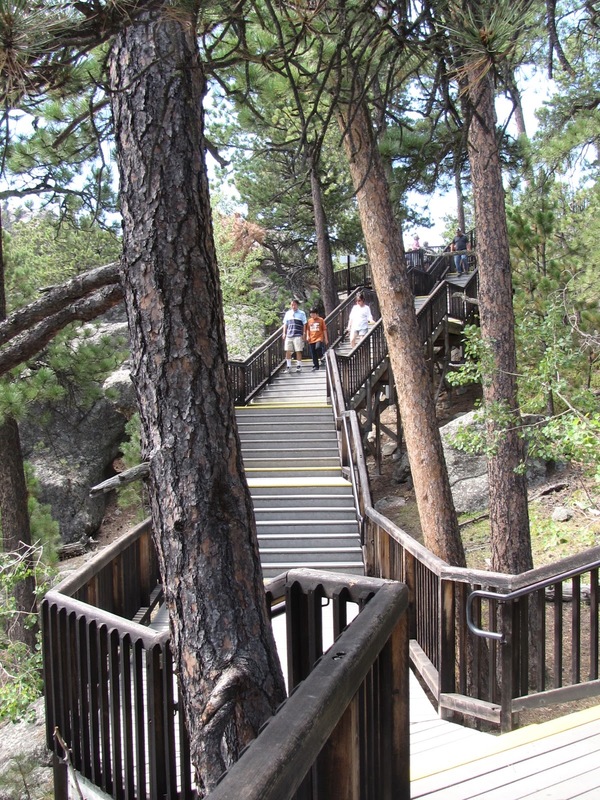 The U. S. Park Service does an excellent job of making the difficult accessible with ramps and elevators and we Levelers benefit. Tip: There's an elevator in the multi-level parking garage. Avenue of Flags. © by Judy Wells. The entrance through the avenue of flags is impressive as are the exhibits and film on the lower level. Tip: Use the elevator. You will have to do some walking to approach as close as you can to the carvings. President's Trail has more steps than you want. © by Judy Wells. Tip: The President's Trail will take you to a number of different angles for photographing but the difference isn't worth the more than 100 steps up and then down. I know because I walked it. © by Judy Wells. © by Judy Wells. Sculptor Gutzum Borland's studio is interesting but you'll have about 15 steps down then back up to get to and from it. The bison burgers in the cafeteria are good as is the ice cream (Thomas Jefferson is credited with introducing it to America). The best part of Moose Drool brown ale is its name. Chief Crazy Horse Monument. ©by Judy Wells. 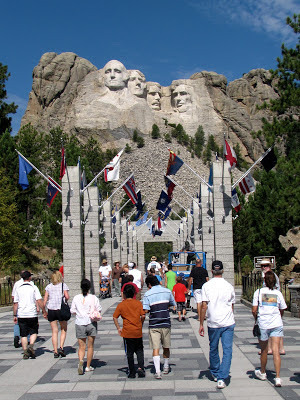 The insensitivity of carving enormous faces of presidents responsible for usurping their lands into a mountain sacred to the Dakota, Lakota and Nakota peoples was ignored by most Americans but not the native peoples. They responded by commissioning an even larger sculpture of their beloved Chief Crazy Horse. So much larger that the four presidents' heads of Mount Rushmore easily fit atop the head of Crazy Horse. Korcsak's drawing overlays the mountainside. © by Judy Wells. It is a work in progress and, like most of the world's cathedrals, will continue over several generations. Sculptor Korczak Ziolkowski knew this, providing detailed plans for his family. His widow Ruth and seven of their children carry on the work today. Korczak's maquette with the unfinished Chief Crazy Horse in the background. © by Judy Wells. 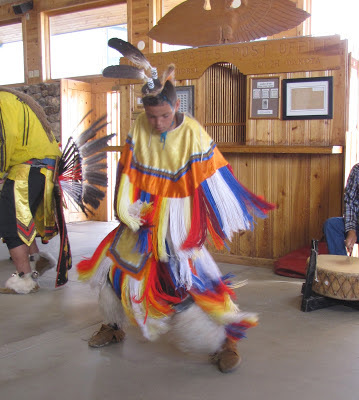 All is funded by private donations but there is no overt begging at the facility below which includes the still developing Museum of the American Indian, an excellent film, Korczak's workshop and models and demonstrations by area Plains people. Dance demonstration. © by Judy Wells. Tip: There are very few steps here and a bus will take you as close as it is possible to get to the base. It is well worth the nominal charge.